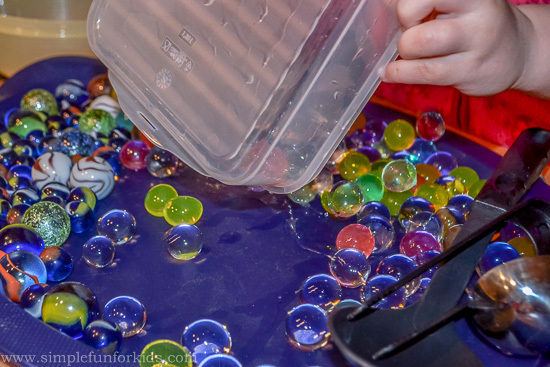 This was our first sensory activity with water beads and marbles – make sure to check out the really fun Painting with Water Beads and Marbles activity we did a few weeks later! 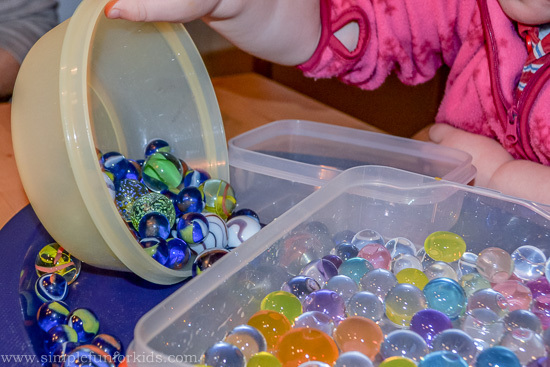 We had just bought a bag full of marbles with different looks, textures and sizes, and I gave them to E along with a bowl full of water beads and a tray, and let her explore them however she wanted. Tray, box, sensory bin or similar to contain the other materials. Kitchen utensils like tongs, ladle, etc. (optional). 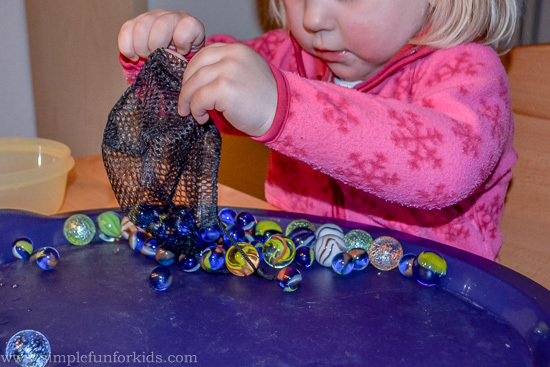 She stuck her hands into the bowls of marbles and water beads and felt the difference. 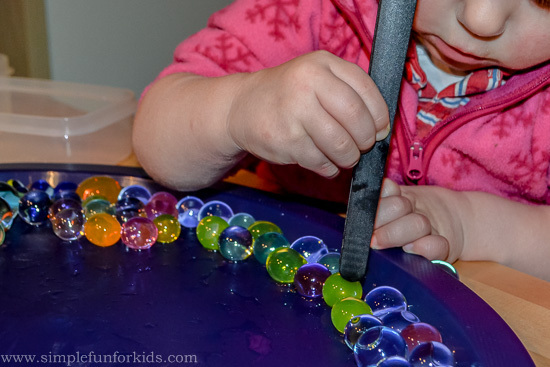 followed by the water beads. The tongs remained her favorite, though. 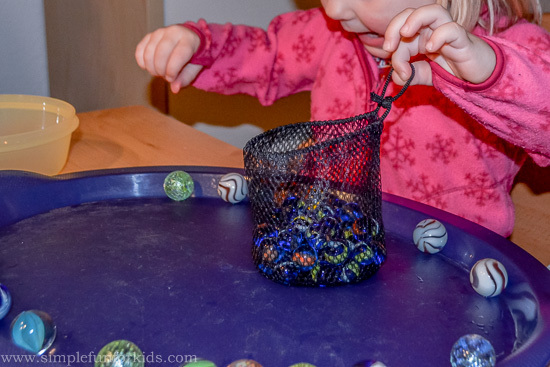 She spent quite a lot of time using them to pick up marbles, then squeezing the tongs over one of the plastic bowls until the marbles “shot out” into the bowl, making a satisfying “plunk”. 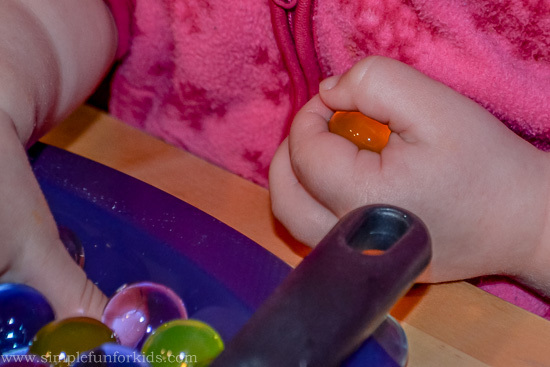 Once all the marbles were back in a bowl, she sorted the water beads into another bowl. 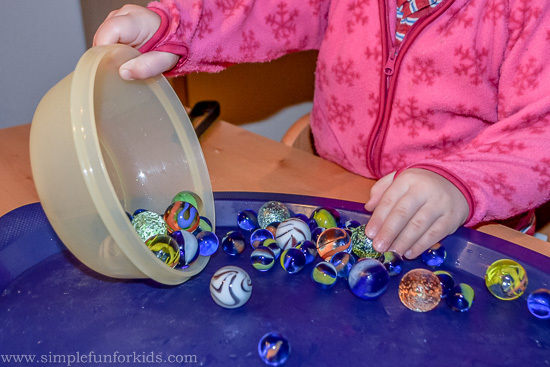 She wasn’t done with the marbles yet, though, and dumped them back on the tray to start over. 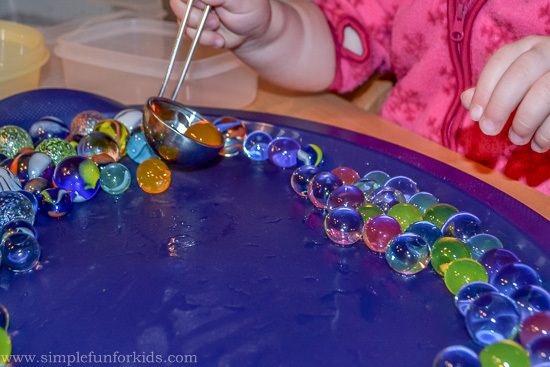 When setting up this activity, I’d thought she’d be more interested in the water beads, but she actually spent a LOT of time exploring those marbles! 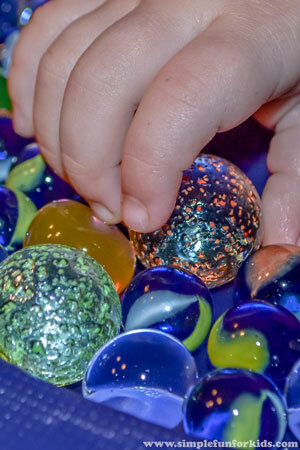 Does your child enjoy playing with marbles? 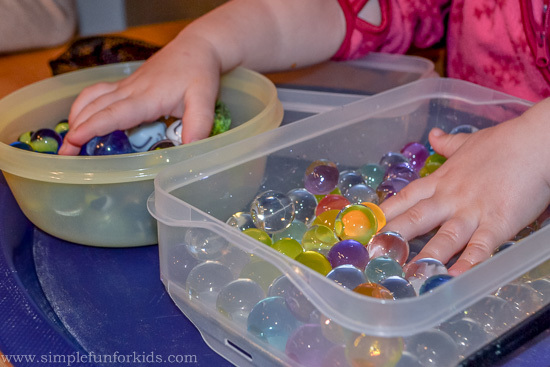 How have you used water beads and marbles? Leave a comment below! We love sensory play! This activity looks like lots of fun! Thanks for linking up at “A Little Bird Told Me” Wednesday link party. You have been featured on Mama’s Happy Hive blog! Please come again! This is such a great idea. I love it. Nice to use in a classroom during free play. Thank you for the kind words, Lilith!